I second guess myself. A lot. I suppose it is in my nature. Over time I have built myself into a person who tries to always do he right thing. In order to be that person I have to know what the right thing is. But rarely is the “right thing” easy and obvious to discern. In this day and age there are so very many different paths to walk, each of them saying that this particular path is the right one. I find myself always second guessing whether I am following the right path. Every day it seems like there is a new fact, a new piece of evidence, a new point of view that makes me question my choices and my beliefs. Sometimes I just wish that I could pick a path, stick to it and ignore everything else. But I can’t. No matter how much I might wish that I could do so, no matter how hard I try, I can’t- I just can’t. I always second guess myself. I always doubt. Doubt… at the moment my mind is full of it. I am not sure if it is strange, or fitting, that I should be in such a state right now. Because, for the first time in a long while, I am starting to finally feel the ground beneath my feet. Things are finally starting to make sense- everything is clicking into place. At long last I can see the faintest of glimmers ahead of me on the road. And yet, at the same time… I doubt. I guess these reflections are prompted by the fact that it has been nearly a year since I stared this blog. My first post was on March 10, 2013. A lot has happened since then. I started this blog in large part because Sunshine Mary had deleted her old one, and I wanted to preserve some of what I had written before. Since then I have written on a variety of topics. Yet the overall focus has tended to be the same. Therein is found some of my doubt. If you had asked me what kind of blog this was when I first started up, I would have told you that this was a “Red Pill” themed blog, although perhaps one with a Christian theme or perspective. For a while I would have called this blog a “Red Pill Christian blog”, and myself a “Red Pill Christian blogger.” But now? I’m not sure what I am anymore, or what this blog is. This isn’t a Game blog, as I am certainly no PUA. I’m not a MGHOW nor a MRA activitst. And I am not some kind of rationalist observer, watching it all from the sidelines without a care in the world. I suppose that, given what Chad, Deep Strength, Free Northerner and I have been working on as of late you could call me a “Christian Masculinist.” Because in that project I find a sense of purpose that I haven’t felt for a long, long time. And yet… I doubt. I envy the certainty that others seem to possess. That sense of self-assurance that lets them steam forward no matter what. The ability to set aside all doubt. I can only imagine what it must be like. I would have been untrue to the generation of thy children. then I perceived their end. What does Jesus mean by this? He means that we shall see and know God, and He shall see and know us. For what else matters but that on the Day of Judgment? I’ve said it a million times. I don’t care if you’re a theist, agnostic or atheist. The Book of Genesis is the greatest work ever penned. I’ve always wanted to do a break-down of it. But I’m getting off topic, ever so slightly. Have you wondered why the women with whom you “click”, women you really “get” at a deep level, women with whom you feel a True and deep connection never seem to want you back? Go ahead, lie to me. But you, in the darkest recesses of your being, know exactly what I mean. Sure, there have been girls with whom you’ve shared a fair amount of interests/attitudes/opinions in your time on earth. Saint Columba (Irish: Colm Cille, ‘church dove’; 7 December 521 – 9 June 597) was an Irish abbot and missionary credited with spreading Christianity in present-day Scotland. He founded the important abbey on Iona, which became a dominant religious and political institution in the region for centuries. He is the Patron Saint of Derry. He was highly regarded by both the Gaels of Dál Riata and the Picts, and is remembered today as a Christian saint and one of the Twelve Apostles of Ireland. Columba reportedly studied under some of Ireland’s most prominent church figures and founded several monasteries in the country. 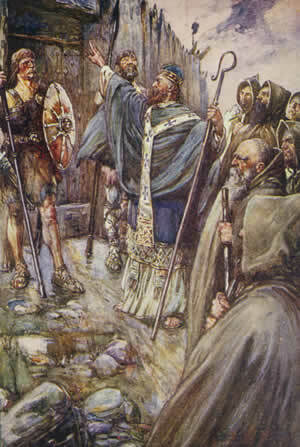 Around 563 he and his twelve companions crossed to Dunaverty near Southend, Argyll in Kintyre before settling in Iona in Scotland, then part of the Irish kingdom of Dál Riata, where they founded a new abbey as a base for spreading Christianity among the northern Pictish kingdoms who were pagan. He remained active in Irish politics, though he spent most of the remainder of his life in Scotland. Three surviving early medieval Latin hymns may be attributed to him. As usual, you can read the rest of his story over at wikipedia. Besides the great acclaim that has been given to him for his influence in spreading Christianity through Ireland, England and Scotland (especially the latter), I was intrigued by his fall from grace, as it were. Columba became involved in several disputes, which lead to several battles that resulted from his actions. As penance he devoted himself to missionary work, especially in Scotland, with the goal of converting as many people as had died in battle because of him. Often times we think of Saints who were sinners as people who were born away from the faith, or left at a young age, and then found their faith late in life. Such wasn’t the case with Columba. Saints like Columba are important reminders that even those who have immersed themselves in their faith are still human, and still vulnerable to temptation and sin. All the single guys in our group figured the dancing that night was going to be a bunch of couples. We couldn’t have been much further from the truth. Some women had ‘dates’ whom I’m not even sure they went on a date with, but simply came to the dance with. I say this only because several of the women with ‘dates’ told me that they didn’t want to dance with anyone besides myself all night. Some of them in the same group of friends. At a couple points I had women I’d never seen before approach me not to dance, but to introduce themselves as they were heading out the door, say they were sad I didn’t ask them, but that they wanted to give me their name and dance with me next weekend. Some women I’d known for weeks suddenly seemed more interested. While I can write a good deal of it off to V-Day, there were certainly both better looking men and better dancers out there. So the whole thing was bizarre at first, until I realized that with my decision to pursue vocational possibility I’d altered my behavior. I’d talked and stopped caring as much about what I said, but just saying it and having fun. I’d avoided, purposefully, some of the women whom there’s more a lustful tension than a healthy tension in the dance. I’d talked about my faith and the writing at Depths to Wilderness with a couple of them. I’d taken some beginners, and showed them how to really follow and enjoy themselves out of a place where I didn’t care if we connected or not, I simply wanted them to have fun and I wanted to dance. Nothing more. I’ll admit that I did ask one girl’s number, but it was out of reflex. As soon as I asked, I realized she instantly could tell the difference, got lukewarm, and I avoided doing so any more. Chad, by adopting an attitude of not caring what was going on around him, achieved what some folks call “outcome independence.” When a man achieves that state of mind, he seems to be above it all, at least, so far as women are concerned. They (women) find this highly attractive, and will be drawn to a man who can display it. I suspect that is because it is an attitude that normally manifests in men who are extraordinarily confident in themselves. Or otherwise stated, men with the highest levels of the Power attribute. I bring this up because his story clued me in about some of my past experiences with women. One thing that always, always frustrated me is that I always seemed to receive far more attention (and more favorable attention) from women that I was not interested in than women who did interest me. This started in high school and continued through college and beyond. At the time, I didn’t understand. Later, after finding this part of the web, I briefly examined my past to try and solve this. My attempts to answer the question revolved around the fact that the women who interested me were Christian women, and the ones who didn’t interest me (yet were throwing IOIs at me, including ones I could pick up) were not Christian. I wondered whether Chuchian attitudes were to blame, but that didn’t seem quite right to me. So I just let it go. Now I can see what my problem was: I was treating Christian women differently than non-Christian women. I was completely natural, completely myself when dealing with non-Christian women. I didn’t care what they thought of me, and it showed. [DG: In case I wasn’t clear- this isn’t about “being yourself”. It is about not caring what women think of you.] As a result, I demonstrated outcome independence towards them, and they found it attractive. On the other hand, for Christian women I was on my best behavior- I was every bit the “nice Church boy” that I was raised to act like. In short, a Beta White Knight who put women on a pedestal. And it showed. And it drove those women, women who I considered marriageable, away from me. Since then, I have taken women off of my pedestal, and placed God there, where He belongs. But the temptation to replace them there still lingers within me. Part of me wonders if this is a problem that all men have faced from very beginning. The best defense against this, I should think, would be a good offense- adopt an attitude towards women that is playful and teasing, one that resists placing them on a pedestal. Here is a great comment by JDG delving into feminism and its incompatibility with Christianity. This applies just as well to relations between the sexes as it does between the races, I should think. Women have received boosts for so long they are apt to shriek if one mentions leveling the playing field (for example, by aiming for equal college admissions). Also, Joseph of Jackson is back. This comment at JustFourGuys is one that I found fascinating. The ideas that it broaches bear further examining at some point. are men with power and status attracted to women who are attracted to power and status? Yup. Since all women are attracted to power and status, by definition men with power and status are attracted to such women. what are women attracted to some men and not attracted to other men? Well, you might need to go elsewhere to improve your English, but I can at least answer the question. See here. christian marriage is the same as secular marriage? Sadly, this is often the case. It is not supposed to be, of course. But nowadays its hard to tell secular and Christian marriages apart. Ok, clearly the lady who asked this needs to read this post. Then leave him, and start courting, not dating. There were a few of these. My advice is to consult a male friend who will be brutally honest with you. Actually, several, just to even things out. And that does it for this random post. Thanks for sticking through it everyone. I may update it over the week if I find anything else interesting, as I suspect my posting will be light until then. and no torment will ever touch them. but they are at peace. their hope is full of immortality. and like a sacrificial burnt offering he accepted them. and will run like sparks through the stubble. and the Lord will reign over them for ever. 27 Then Peter said in reply, “Lo, we have left everything and followed you. What then shall we have?” 28 Jesus said to them, “Truly, I say to you, in the new world, when the Son of man shall sit on his glorious throne, you who have followed me will also sit on twelve thrones, judging the twelve tribes of Israel. 29 And every one who has left houses or brothers or sisters or father or mother or children or lands, for my name’s sake, will receive a hundredfold, and inherit eternal life. 30 But many that are first will be last, and the last first. While the passage from the Book of Wisdom probably referred to all of the faithful who die for their faith, it seems especially fitting for the Apostles. This is because all but one of them died a violent death (the exception is John, who is believed to have died around 100 A.D.), and many were tormented before their deaths. The first passage exemplifies the disconnect between those who believe and those who don’t. For the latter fail to realize that this life is a mere transitory state. It represents a chance to be tested, to be purified and to be found worthy by God. For what seems like a loss in this life is a gain in the next, which our Savior declares is eternal. Jesus is reassuring the Apostles here that the promises made before will be honored, and that what seems like a sacrifice is really an investment. 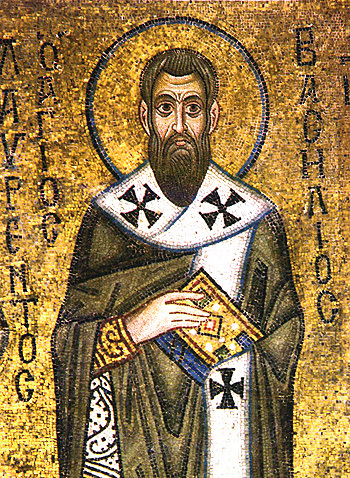 Basil of Caesarea, also called Saint Basil the Great, (329 or 330 – January 1, 379) (Greek: Ἅγιος Βασίλειος ὁ Μέγας) was the Greek bishop of Caesarea Mazaca in Cappadocia, Asia Minor (modern-day Turkey). He was an influential theologian who supported the Nicene Creed and opposed the heresies of the early Christian church, fighting against both Arianism and the followers of Apollinaris of Laodicea. His ability to balance his theological convictions with his political connections made Basil a powerful advocate for the Nicene position. In addition to his work as a theologian, Basil was known for his care of the poor and underprivileged. Basil established guidelines for monastic life which focus on community life, liturgical prayer, and manual labour. Together with Pachomius he is remembered as a father of communal monasticism in Eastern Christianity. He is considered a saint by the traditions of both Eastern and Western Christianity. Basil, Gregory of Nazianzus, and Gregory of Nyssa are collectively referred to as the Cappadocian Fathers. The Eastern Orthodox Church and Eastern Catholic Churches have given him, together with Gregory of Nazianzus and John Chrysostom, the title of Great Hierarch. He is recognized as a Doctor of the Church in both Eastern Orthodoxy and in the Roman Catholic Church. He is sometimes referred to by the epithet “Ουρανοφαντωρ”, “revealer of heavenly mysteries”. This extract was taken from the wikipedia article on St. Basil, and I strongly encourage everyone to read through it. He was a fascinating man, balancing deep thought and discernment with active service to his flock and those in need.